The final step in building a wooden picture frame is applying the finish. With over a hundred finishing options and endless custom colors, finishing is a particular art that we have fine tuned over the years. 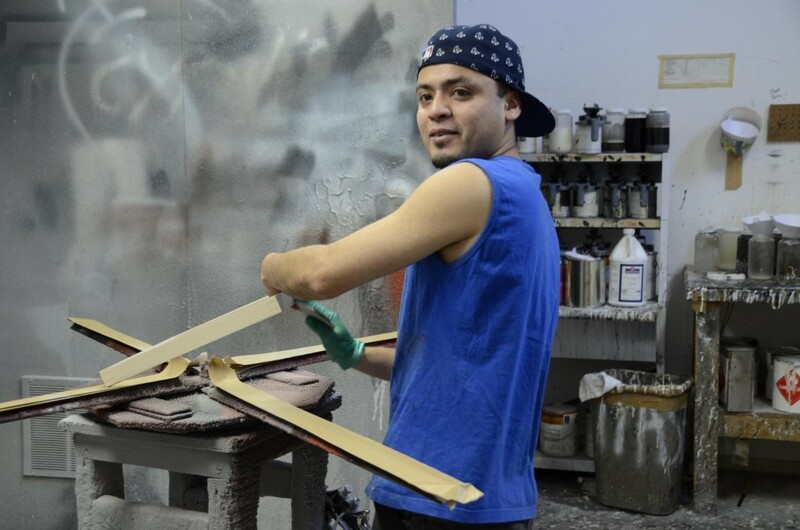 Many of A Street Frames finishes are stains with a tinted lacquer, but we also use oils or waxes, hand painting with Japan paint or milk paint, gilding, and opaque lacquers. 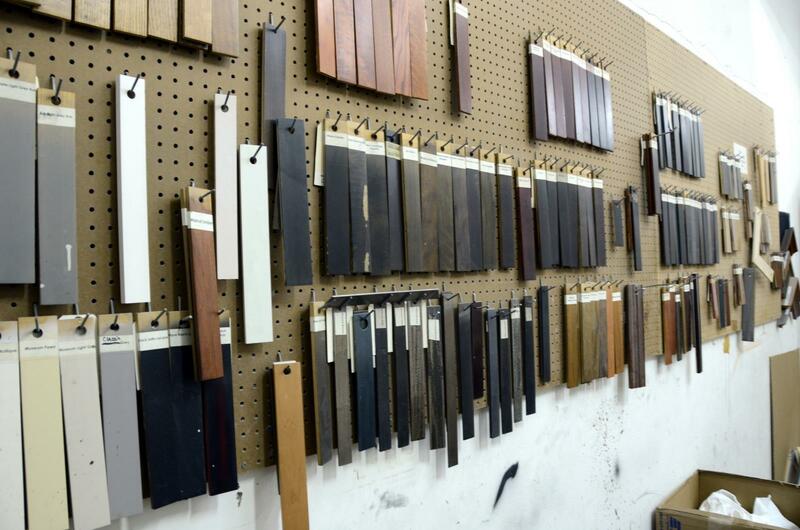 Because of the variety of finishes we offer, the steps vary slightly for each process. The first step for any finish is to inspect the frame and make sure there are no sanding marks or unfilled imperfections. Often another set of eyes can spot something the sanders missed and it can be sent back for a little extra work. If the frame is a natural finish it is ready to be sprayed. The first coat is with sanding sealer. This product is similar to a primer for painting a wall. The sealer covers the pores of the wood and gives an extra smooth surface for the lacquer to adhere to. After two layers of sanding sealer, the frame is lightly sanded with 320 grit paper. The top coats, 2-3, of lacquer is then ready to be applied. Sometimes this is a clear coat of lacquer, other times we add a touch of amber coloring to allow a closer match to an aged wood. The final step once the lacquer dries is to buff the frame to a smooth an even sheen. Now the frame is ready to head to the fitters. Illustration 1: A quick fix before spraying the next layer. For an oil or stained frame we apply the coloring with a rag. This step sometimes highlights imperfections that were not visible before so spot sanding is required then more finish is added. Once the color is correct to our sample chip, which ensures consistency, the frame is sprayed with the same process as a natural finish. To ensure a consistent finish we tint the lacquer slightly to match the stain. This final coat gives the frame a satin gloss and even appearance. 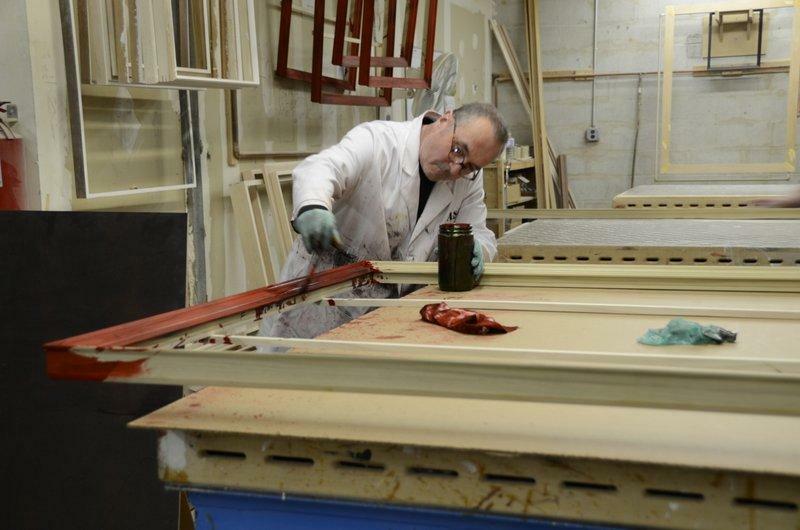 Mark, the owner, applying a red stain to a large frame. 320 grit sanding after the sealer has been applied. This can be done with two tones for a unique look. Black over red is very popular and in that case the red stain is applied and sprayed with a sealer, then the black stain is a applied and rubbed off by hand at the edges. This rub can be delicate or aggressive to show varying amounts of red depending on the style preferred by the customer. From there the top coat process is the same. For one of our most popular finishes, the white lacquer, the process takes much longer because of the many layers involved. The first step is to spray the frame with a layer of white primer. White has a way of highlighting any imperfections. This first layer goes on thin and raises the grain slightly and picks up small pits and indentations that would be invisible in any other finish. The frame gets another sanding and putty is applied to any indents, particularly at the joints. This takes time to dry and is sanded all over again and sprayed with a second layer of primer. This process will be repeated until the frame is perfect. Sometimes it takes 6 or more sprays to create the frame to our high standards and it will be smooth as glass. The final coat is the chosen lacquer color, often one of the many whites that are an exact match to certain mat boards, or a solid color for a nice smooth contrast. White lacquer frames primed and puttied, waiting for a second full sand. Hand painted finishes are just what they sound like. Japan paints and milks paint are applied carefully by hand and take a bit more time to ensure even consistent strokes. These frames take on a much more crafted feel which complements some works of art wonderfully. Waxes are another finish that require more hand treatment. These often have two layers of colored wax which are applied by rag and allowed to dry before being rubbed out to give an antique look to the frame. This finish looks great over an antiqued frame which has been crafted to look like it has been around for a while. With so many options for finishing you are sure to find the perfect match for any style of artwork or to match your décor. 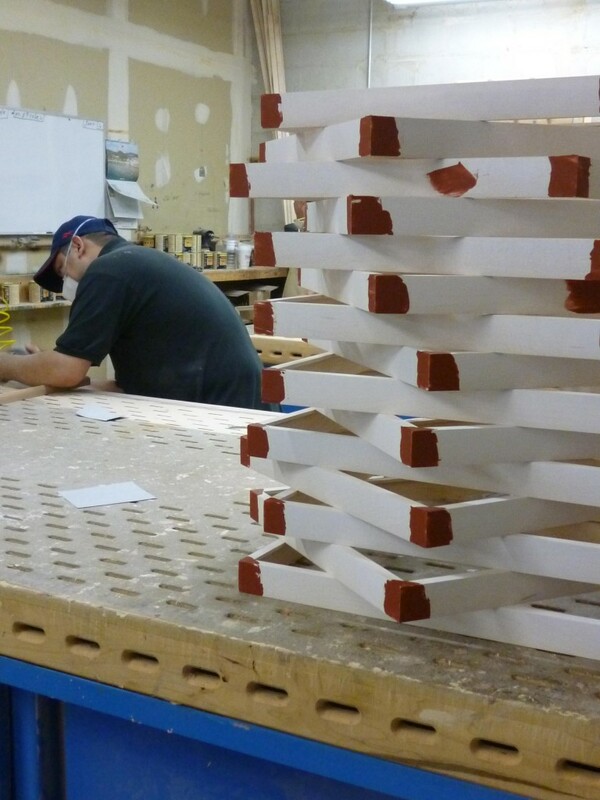 We can even work with you to craft custom colors for staining if you can’t find the perfect piece. 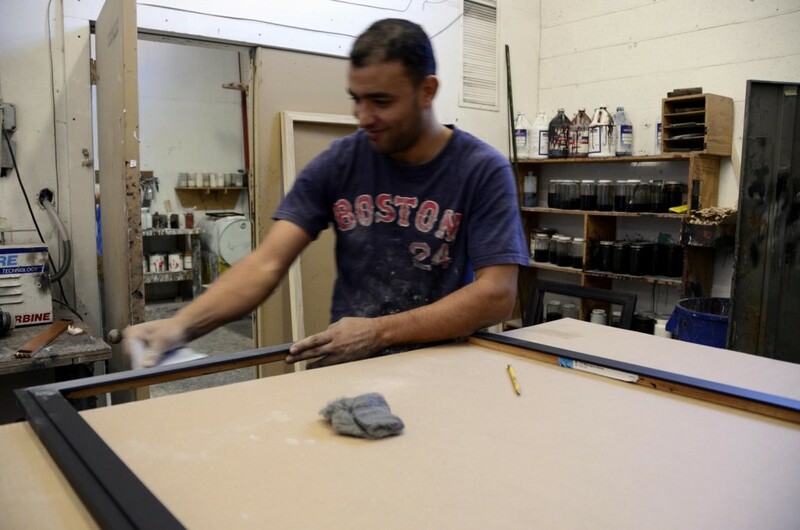 Our finishers take all of the hard work that goes into crafting your custom frame and make it perfect to hang on the wall. Every frame that we make gets the same exact attention and the end result is always a custom frame for your individual work of art. Hopefully you can understand why it takes a bit longer to have a custom A Street Frame created for your artwork. In the end you will have a unique frame to go with your unique artwork and it will last you for many years to come.